WASHINGTON — After a 140-mile march from Philadelphia to Washington, D.C., police arrested more than 400 protesters on the steps of the Capitol building. Monday’s demonstration was part of a civil disobedience action in support of reducing the influence of money in politics and strengthening the right to vote. 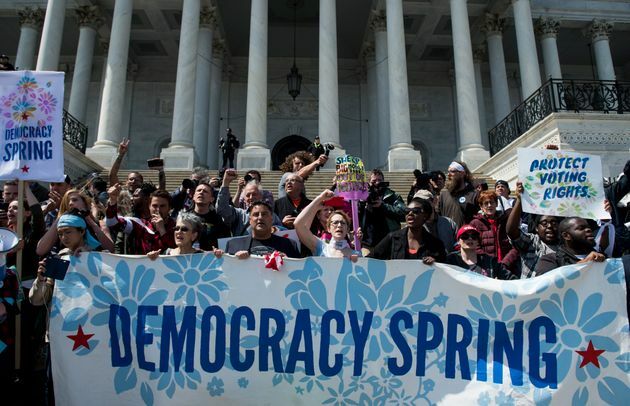 The protest and march, billed as Democracy Spring, brought together a wide coalition of groups from various political perspectives in support of campaign finance reform and voting rights. It marked an important moment for the growing movement to reform the way campaigns are financed. Those inside the beltway have long seen the matter as a process issue of limited interest to citizens, but interest has skyrocketed during the 2016 race. Sen. Bernie Sanders’ (I-Vt.) has issued denunciations of a “corrupt campaign finance system” during his push for the Democratic presidential nomination and Republican candidate Donald Trump has declared that his self-financed campaign makes him uncorrupted by donors. Monday’s protest brought that dissatisfaction out of the conversation about presidential personalities. The event’s diversity was underscored by the appearances of both Code Pink, an anti-war social justice group, and Take Back Our Republic’s John Pudner, a conservative tea party activist who joined the march in Maryland. “What I’ve never seen before is right wingers and Code Pink at a protest making common cause,” said poverty activist and reporter Linda Tirado. Protest campaign director Kai Newkirk, head of the activist group 99 Rise, was among those arrested. Others included the online news personality Cenk Uygur, criminal justice reform advocate Michael A. Wood Jr., Progressive Change Campaign Committee co-founder Adam Green and former California Secretary of State candidate Derek Cressman. Protest organizers hoped to highlight mass dissatisfaction with the way political campaigns are funded and recent efforts to limit voting rights including the failure of Congress to reauthorize the Voting Rights Act. Most Americans are increasingly opposed to the current state of campaign funding, where lawmakers can spend up to four hours per day raising money and the super-wealthy increasingly dominate the most competitive races through super PACs and nonprofit groups. Democracy Spring activists staged a civil disobedience action on the steps of the Capitol building in Washington, D.C., on Monday to protest the waypolitical campaigns are funded andattempts to reduce the right to vote. For many at the event, the issue of money in politics was seen as a roadblock to legislative change that they would like to see enacted. The coalition of groups said that they are organizing in support of key legislation that they want Congress to enact. These bills include the Government By The People Act, the Fair Elections Now Act — both of which would create a system of publicly financed elections for congressional races — and the Democracy For All Amendment, a constitutional amendment to overturn both the 2010 Citizens United decision and the 1976 Supreme Court ruling that established that the spending of money on political campaigns is a form of protected free speech. They also support the Voting Rights Advancement Act and the Voter Empowerment Act. After the march from Union Station, it took more than six hours for police to arrest the protesters who chose to sit in on the Capitol steps. They were taken in zip-tie handcuffs into large buses to be taken away and processed. The 1,000-plus protesters who chose not to get arrested stood behind the police barricade cheering on those risking arrest.